In less than 13 minutes, you’ll learn to create an adorable scrapbooking mini album that’s perfect for a quick scrapbooking project. You can attach it as part of the design of your layout or turn it into a thoughtful little gift for your loved ones. You don’t have to spend money on buying mini albums anymore. 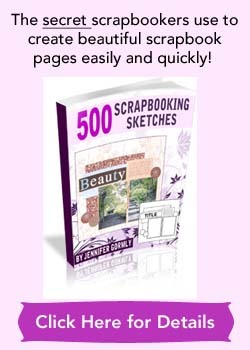 You can now make your very own mini albums that’s not only attractive, but save you good money too. Be warned though, you might love your mini album too much and keep it for yourself instead of gifting it! 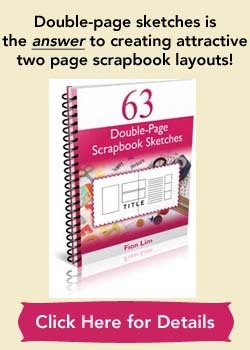 Loretta will demonstrate in this scrapbooking video, step-by-step on creating a mini album. What I like about this technique is that it involves little embellishment, but mostly cardstock and patterned paper. Try to go for flat embellishments as bulky ones might cause the album to be hard to close up. You can find the paper dimensions listed below. First, get four sheets of 12″x12″ cardstock. Two sheets in one color and another two sheets in a coordinating color. For the first color, cut one piece of 6″x12″ and score at 2 3/4″, 3″, 9″ and 9 1/4″. Next cut three pieces of 5 3/4″ x 12″ and score at 3″ and 9″. For the second color, cut three pieces of 5 1/2″ squares (we only need three pieces and not four pieces as mentioned in the video). Next, cut one piece of 5″ x12″ and score at 5″ and 8 1/2″. For album cover and large openings, cut patterned paper of 5″ squares. For flaps, cut 5 “x 2″ or 2 1/4”. For the back flap, cut two pieces of 2″ x 4 3/4″ for them to be glued to the bottom. For other flaps, cut four pieces of 3″ x 4 1/2″. Want another way of making a mini album? Then you must check out this square-around mini album video. Have a blast making mini albums! I watched this video several times and can’t figure out what to do with the fourth square of the second color. In the video example, it is blue. Did I miss something? Otherwise, I found this to be so beautiful and really doable for a beginner. There’s quite a number of paper dimensions in this video tutorial done by Loretta, so I’m not surprised if you were lost. And you know what, I think you’ve spotted a mistake. :) Instead of 4 pieces of 5 1/2″ blue squares mentioned in the video, there’s should just be 3 pieces. Two are used as the front flaps and the last piece as the backing for the album. Thanks for pointing this out and I’ve amended my dimensions in the written dimensions above. If anything’s unclear, let me know again.